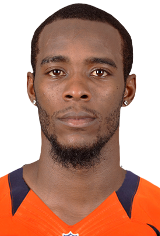 On Wednesday, Denver Broncos cornerback Dominique Rodgers-Cromartie was carted off the field at Dove Valley with what an MRI later revealed to be a high ankle sprain. "He has done it before, so I am not overly (concerned)," Broncos coach John Fox told USA Today after practice. "We will just get him healthy and get him back out there." According to Steven O'Reilly, a Florida-based golf professional who plays flag football with Rodgers-Cromartie in the offseason, DRC will be out approximately four-to-five weeks. High ankle sprains are hard to predict, but if DRC does end up being out for five weeks, that would put him on track to return on September 4, a day before the team's season opener against the Baltimore Ravens. Right now, a realistic date to expect DRC's return by could be the team's Week 2 match on the road against the New York Giants. In DRC's absence, Chris Harris Jr. is expected to play across from Champ Bailey.